As part of my mission to show our exchange student as much of Hawai’i (or at least Oahu) as possible, I took the gang on a self-guided walking tour of Honolulu today. By doing it on a Sunday, we saved on parking, avoided crowds, and didn’t have the opportunity (much to my kids’ delight) to go into any of the museums for tours. 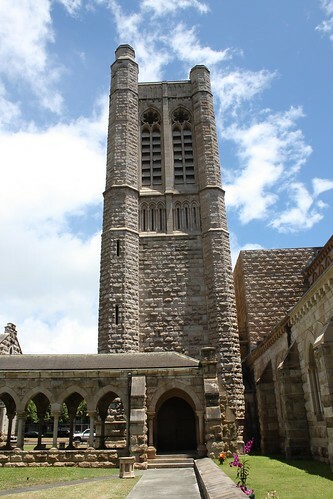 Armed with an informative printout from Frommer’s, we started at St. Andrew’s Church. The kids needed a bathroom so I asked the first people we saw — who just happened to be the bell ringers. They encouraged us to join them in the bell ringing (practice is Tuesday nights, no need to be a member of the church) and gave us great tips on how and where to add to our tour. Definitely filled with Aloha spirit. The next stop was Washington Place, the home of John Dominis husband to Queen Liliuokalani, who lived there after her imprisonment at Iolani Palace (from reading the book The Betrayal of Queen Liliuokalani, I gathered that she didn’t like living at Washington Place prior as John Dominis’ mother also lived there and he was a total mama’s boy). My son suggested that Father Damien was a “Cuban” (get it — “cube?”). Despite being afflicted by the teen years, he can be pretty funny sometimes. 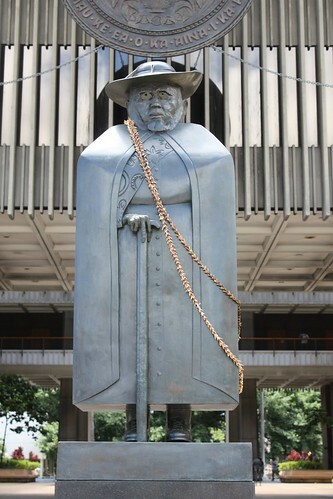 Behind Father Damien is the Hawai’i State Capitol. By reading the guide, we learned that the Senate and House rooms are cone shaped like volcanos, and that the columns represent palm trees. 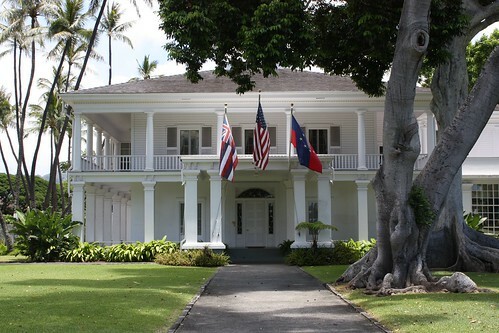 In contrast to the 1960s Capitol Building stands Iolani Palace, the only royal palace in the US. According to the Frommer’s guide, there’s actually two — the second being the Royals’ summer home in Kona on the Big Island. No tour today, but definitely worth returning to (sans smaller kids). 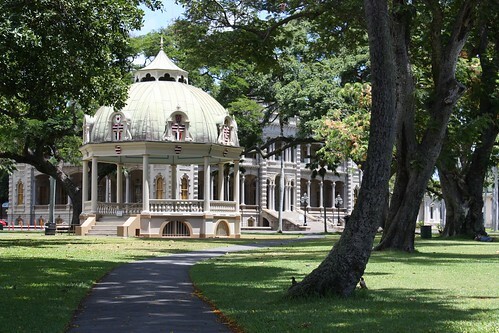 And on the palace grounds stands the lovely Bandstand built for King Kalakaua’s Coronation. 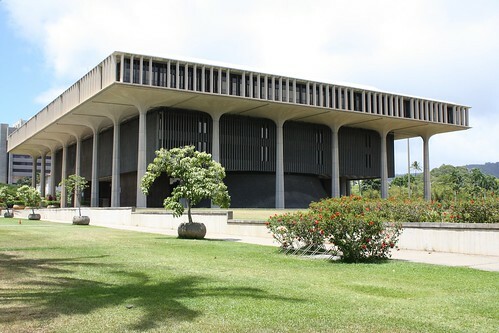 Across the street is the main reason for our tour — Aliiolani Hale (the State Judiciary Building), AKA Hawai’i 5-O Headquarters. J and I watch Hawai’i 5-O together as do her parents back in Germany. We love picking out locations where we’ve been, and they love recognizing some of the place names their daughter has talked about. 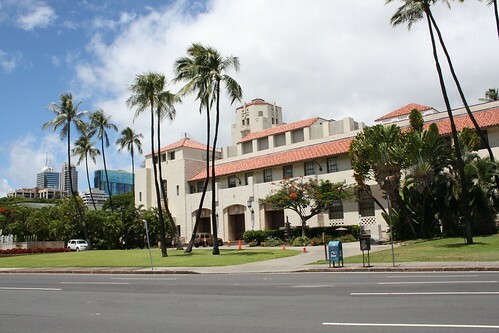 Not on the tour, but a must-see next door for us, is the Honolulu Post Office. I’m quite certain that these are the arches under which McGarret and Danno meet with lawyers and banter with each other while underway to the police station or other important business. 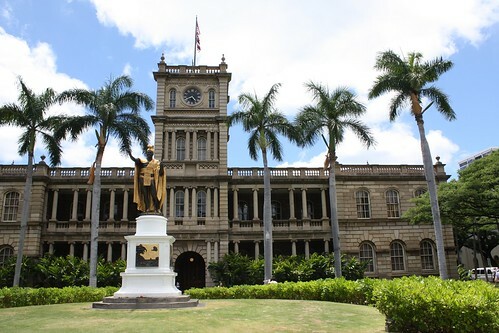 I’ve confirmed via Hawaii Five-0 Undercover that the Court House is indeed the Post Office in real life, and should add that the Territorial Office Building should be part the walking tour as it stands in for HPD in the show. 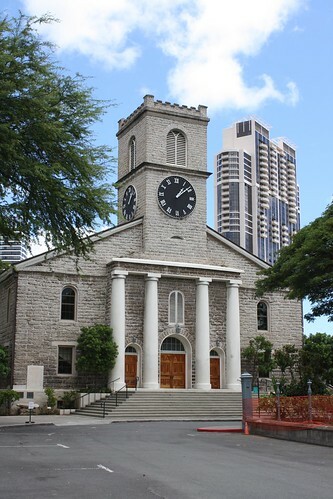 Back to the tour, we stopped at Kawaiahao Church — Hawai’i’s oldest. Then we continued on to Mission Houses Museum. 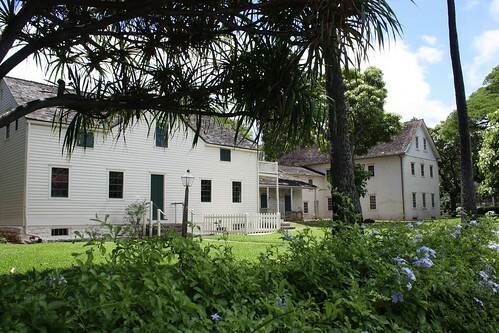 The home of the first missionaries, this group of buildings is a little patch of New England in the center of a tropical metropolis. Heading back to our car, we passed Honolulu Hale, or City Hall. And finally, we passed the State Library. I’ve never been inside, but now I’m tempted. Now we’re home, tired from the heat, but happy to have had a taste of Honolulu and it’s history. 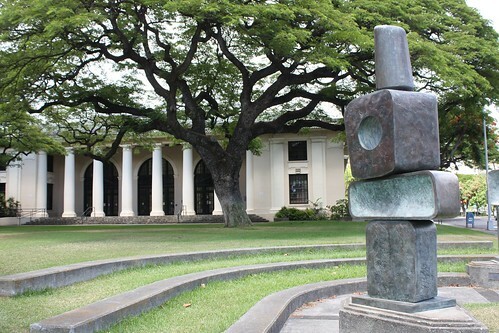 Back to school means back to Ho’ae’ae Park for cool classes! I really enjoyed the session where we made a tote bag, a pillow, and a table runner. I think everyone felt very productive. we’ve also gotten a good reaction to the Pineapple Log Cabin quilts. 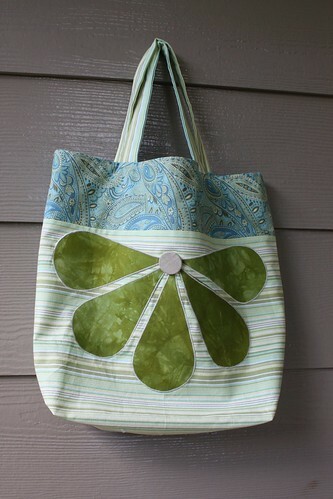 So, this session will attempt to bridge both with two projects: a tote and a small quilt. First we’ll make a lined tote bag with an applique naupaka flower. Since we did needle turn last time, we’ll do fusible this time. 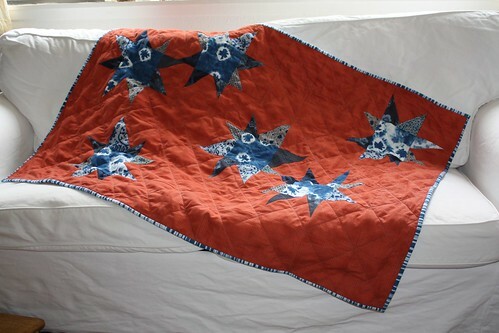 I see this project as a chance to get warmed up and acquainted with your sewing machine. Then we’ll jump into making a quilt. this is the perfect size for a baby gift, or something to stash in your car or office drawer for impromptu picnics or reading a book at the park or beach on your lunch break (yes, we can do that in Hawai’i). 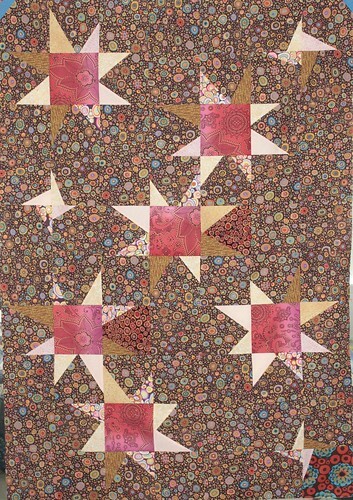 This liberated star is a great block to have in your patchwork toolbox as it doesn’t require great precision, can be made with coordinated fabrics or scraps, scales perfectly, adapts to many aesthetics, and looks great! For those who want to dress it up even more, it can even have extra little bursts here and there. I’ll be teaching at Ho’ae’ae Community Park in Waipahu (Village Park/Royal Kunia neighborhood). Classes are Monday mornings from 10:00 until 11:30 (ish). Classes start on September 12th, 2011 and run for ten weeks. The fee is a mere $20 though you should bring your own sewing machine and will need to bring your own fabric and basic supplies — which we will talk about on the first day. Registration will be August 25th and 26th at the park. That’s this week!! Any questions, leave a comment or call Ho’ae’ae Park at 808-676-8832. The address is 94-709 Ka’aholo Street, Waipahu HI for the map savvy. The kids are back in school, but we’ve got an addition to our family, a lovely exchange student from Germany, and so we need to make the most of our weekends, sharing the wonders of Hawai’i with her. So far, we’ve been boogie boarding at Bellows beach and shopping for school clothes at various malls, where we also introduced her to the deliciousness that is a fresh banana lumpia. On Saturday, we set out to go snorkeling at Hanauma Bay, but the parking lot was full, so we opted to bide our time at Ka Iwi Inlet. This is the same area as Pele’s Chair, the Makapu’u Lighthouse hike my kids hate, and the coastal nature walk we took. 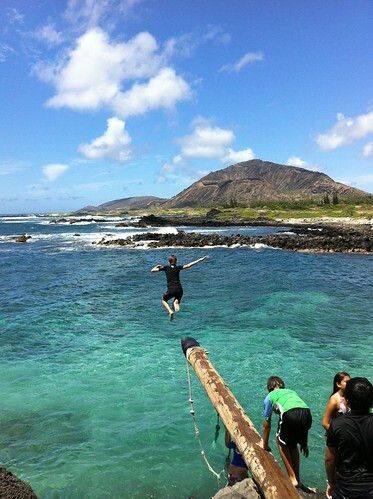 This time we joined the locals and jumped in the water. I particularly enjoyed watching the guy spear fishing nearby. Later we did return to Hanauma Bay and saw plenty of fish, but visibility at this time of year wasn’t as great as we’ve experienced before — so we’ll just have to go back! Sunday we met up with Deborah’s family who are visiting Oahu, and went on a super hike to Maunawili Falls. Yes, I was just in NY with Deborah! Anyway, my kids and I had not been on this hike in several years and it’s such a good one — just challenging enough, and with a waterfall and swimming hole as payoff at the end. I enjoyed the company, and our exchange student proclaimed it the most wonderful hike she’s ever been on. While considering whether or not I had work suitable to submit to Beyond Comfort, I thought about my own artistic comfort zones. Usually I’m up for any style or technique that suits the message I want to convey, so I was thinking that maybe I didn’t have a comfort zone in the sense of preferred colors, styles, or techniques. I am supposed to be working on my next Twelve by Twelve challenge piece. I am procrastinating like crazy though. I decided that I needed to try a collage-y, printed, layered look that I so admire in other artists’ work. I made notes in my magazines, gathered supplies, bought more supplies, made silkscreens, cut masks, and am still not sure where I am going with this. What I am not comfortable with is the planning by way of cutting masks or making screens, combined with the element of serendipity that comes with the unconventional use of those tools like using wet media to transfer crayon color, or dried dye, or newspaper clippings. I’m annoyed that I need to prepare my fabrics with soda ash if I’m going to use dyes, and that I need to make only as much as I plan to use before they spoil. I don’t like that I need to seal my silk screen with duct tape and I don’t have any at home, or that I have water soluble crayons for one technique but not the soft gel medium with which to disperse them. There’s so much to plan and purchase for. I know that if I try these techniques and like them, then I will have the supplies on hand and not be so frustrated, but right now all the prep work is engendering procrastination. I’ve come to the realization that my comfort zone is my boxes of fabric that I can reach into at a moment’s notice and combine in any way that my thread and needle allow. I like the direct. Pencil on paper, blade on fabric or paper, hook to yarn. Much more than that — preparing the ground, mixing the pigments, determining layers and masks — is generally outside of my box. 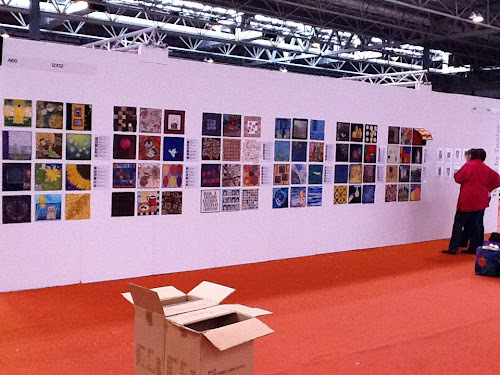 Despite living in Europe for most of twelve years, I never did make it to Birmingham, England for Festival of Quilts. This year, I especially wish I could be there. For one, the 144 small quilts from the first two years of Twelve by Twelve’s art quilt challenge will be there, plus Twelves Helen, Françoise, and Diane! If you are in England this weekend, please take the time to go to the show and search out our exhibit area and say hello. Secondly, I wish I could be there to see SAQA’s Beyond Comfort exhibit in which I have three aprons from my Army Wife series. Helen has been checking things out and says my aprons have a great spot near the front of that exhibit–yay! So, go say hello to my aprons as well. I’ve heard that Festival is the premier quilt and quilt art show in Europe and definitely worth a visit. There are many exhibits, classes, vendors and the works. Helen and Diane will be attending lectures by my heros Kaffe Fasset and Laura and Linda Kemshall. Yes, I am a bit jealous. Slowly but surely I am making progress on the Service Flag quilt. It is an older, traditional, project which I hope to give new life to and incorporate into my Army Wife series. 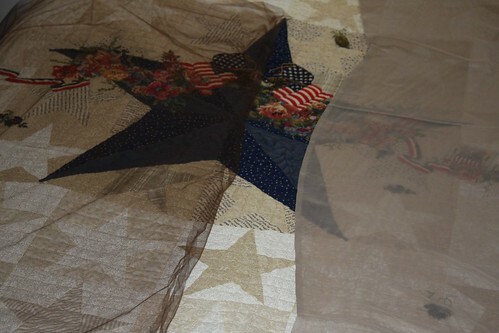 Part of the plan is to add a large shadow over the quilt — the looming presence of Uncle Sam. While it is relatively easy to find opalescent and even sparkly organza and other sheers, finding something matte is not so simple. I looked at the fabric stores here on Oahu and found nothing. I checked JoAnne’s and a large fabric store in Reno, NV while on vacation earlier this summer and found brown tulle and a taupe synthetic sheer. They weren’t exactly what I had in mind, but the price was right and I bought a few yards just in case. In New York last month we went to several fabric stores (including Mood — made famous by Project Runway) and found a wonderful taupe silk. However, when I got home, the organza-type sheers were both too opaque. The silk definitely had the better hand and aesthetic, but the overall look was not right. I had been convinced that the tulle would be too subtle and not play well with my hand quilted and appliqued quilt. But, you never know until you see it in person, and one layer of tulle was just what the project needed. Good thing I had bought enough. And, the taupe sheers I don’t use for this will undoubtedly find homes in some other projects down the line. I am proud to announce that I have an article in Volume 4 of “In Stitches” eMagazine! By the creators of Quilting Arts magazine, this digital magazine has the advantage of including videos and slide shows with the tutorials, plus taking up a lot less space on your coffee table! My article is about making small art with a big impact using collaged fabrics and crocheted and embroidered details. See how a piece evolves from auditioning fabrics to layering the elements and adding three dimensional stitches and other embellishments. Other volumes of In Stitches include articles by fellow Twelve by Twelve artists Deborah Boschert and Terry Grant, and by circle of friends pal Natalya Aikens (Deborah actually lives in both camps!). Go check it out.